At an antique mall last weekend, I found a little bag of broken Bakelite tableware. It included a single pepper shaker, broken Scotty dog napkin ring and broken Scotty place card holder. These pieces are heavily damaged and unable to be repaired. For $8 I thought it was worth a little work to turn a piece of broken junk into new treasures. I did keep the pepper shaker as it is. Hopefully I can find a lonesome salt shaker some day and they can hang out together on my dining room table. In normal circumstances, I would never recommend that pieces of collectable Bakelite be chopped up, drilled into, glued and re-purposed. Bakelite is worth a lot of money and historical value so I do not suggest doing this to a piece that it is good condition. However, if you're lucky enough to find some battered and abused pieces that can't be fixed or tragic strikes one of your collection items, this is a great alternative to tossing it in the trash! The napkin ring is broken, missing the tail, eye and part of the back so I pulled out the power tools to make it into something usable. First, I cut the tiny feet off, then the legs, head and back and belly. I was too chicken to slice the head in two so Pj volunteered to do it for me. 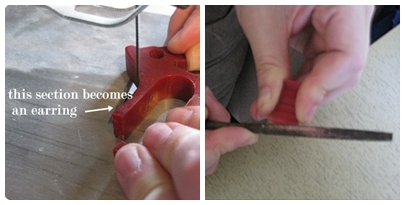 I used a small metal file and various grits of sandpaper to file and sand those jagged edges to smooth perfection. Next, I used a 1/64 inch drill bit to hand drill holes in the pieces of Bakelite. Pj set the drill bit into a handle for me but in a pinch, you can just hold the bit, rotating it between your finger tips. Place your jewelry clip on the back of the Scotty head and drill a hole to match the hole in the jewelry clip. Mine is about halfway through. I picked up a flag from the hardware store for 19 cents. Snipped to length and sharpened by Mad Scientist Husband makes cheap, perfect hat pin blanks. He used a Dremel tool with a grind wheel attachment. No, he doesn't usually wear welding goggles! He was doing some metal working that afternoon. Dab a little jewelry glue on the end of your hat pin and stick those little doggy feet on there. 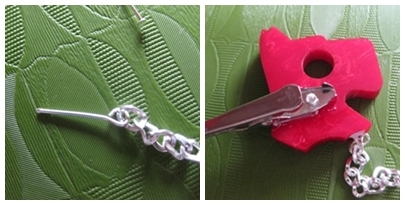 Attach eye pins to a length of jewelry chain. 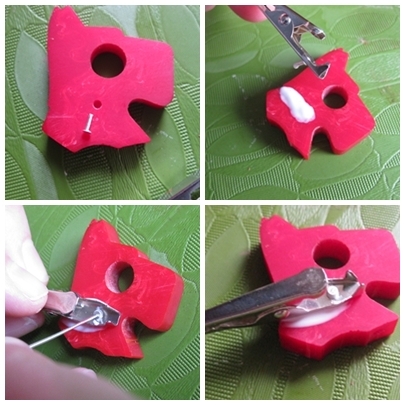 Clip the pins to fit the hole that you drilled and stick it in there with some jewelry glue. Wipe off the excess glue and let it dry. You can add little dog collars, bows around their neck and eyes if you like. I wasn't sure what to do with these strange curved bits but I got the idea to try to carve them out into a V shape, which was very popular in WWII era jewelry. I used several of Pj's small files and after about 15 minutes I had a V shape coming along. One side of the V was smooth so I used a file to carve lines in the Bakelite to match the other side. Pj cut this one chunk down the middle to make two identical V shapes. I glued some earring posts to the back and the job was complete. Since I had two of these curvy chunks, I made two pairs of V for Victory earrings. The one on the left is what it looked liked before carving and filing. The one on the right is my V in progress. These chunks came from the back and belly of the Scotty dog. They didn't require much extra attention. I just smoothed out the edges with sandpaper and filed them to the same size. You can make dress clips, shoe clips, earrings, sweater clips, hair pins or barrettes...whatever you like. I don't have any cherry red earrings in my Bakelite collection so I made mine into rectangle earrings. 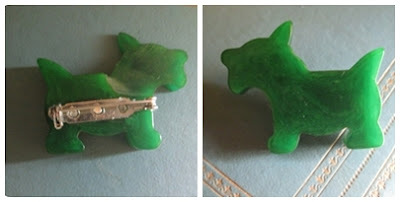 I had some clip on earring backs from an old pair of costume jewelry. This green Scotty dog was originally a very cute place card holder for a table setting. Sadly, the card holder is broken beyond repair and the stand is missing. Although it can't hold a place card anymore, it's the perfect size for a brooch! This was a very easy task. I drilled two holes in the back of the piece, cut head pins to size, lined up the pin back with the holes, added the glue, head pins and that's that! So, here are my new Bakelite jewelry pieces. Not a single scrap of Bakelite was wasted in this project and all of this for under $10! 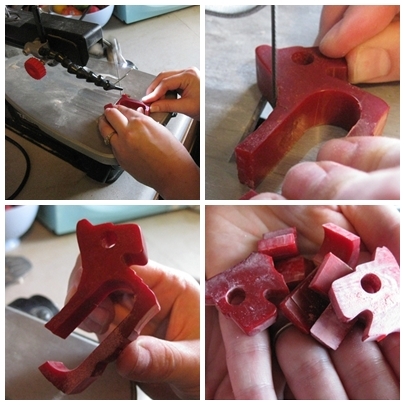 Broken Bakelite pieces can be found on Ebay, Etsy destash listings and places like antique malls and flea markets. OMG!!! ... I love this cardi-clips. What a great idea. White and red really suit you. Wow..what a great find and what an amazing job you did..I love your new jewlry.. This is awe-inspiringly fantastic! You clever, creative, super talented gal you, awesome (and completely cute) work! My fav piece has to be the little green pin; what a bright & beautiful colour! That is so clever! I would never in a million years have thought of this. The sweater clip is so cute! oh my! I do love the caridgan clips! Very cool, I'm lovin your little DIY sessions. You are making my soon to be and me talk about renting an RV and heading east! Our thrift stores have gone and dried up years ago. We find the occasional thing here-or-there but nothing at the prices and caliber we use to find. We want new picking grounds. After the wedding I maybe asking you for some shopping advice as we head out east!